Astronomers have probed deeper than before into a planetary system 130 light-years from Earth. The observations mark the first results of a new exoplanet survey called LEECH (LBT Exozodi Exoplanet Common Hunt), and are published today in the journal Astronomy and Astrophysics. 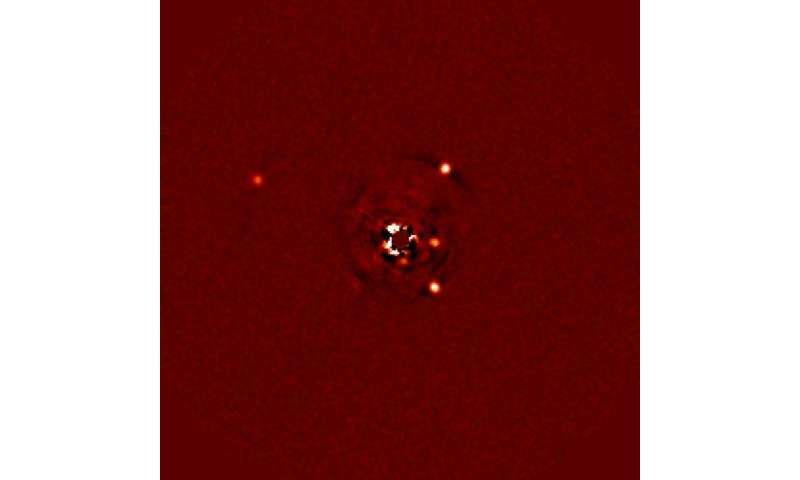 The planetary system of HR8799, a young star only 30 million years old, was the first to be directly imaged, with three planets found in in 2008 and a fourth one in 2010. "This star was therefore a target of choice for the LEECH survey, offering the opportunity to acquire new images and better define the dynamical properties of the exoplanets orbiting," said Christian Veillet, director of the Large Binocular Telescope Observatory (LBTO). The LEECH survey began at the Large Binocular Telescope (LBT) in southeastern Arizona in February 2013 to search for and characterize young and adolescent exoplanets in the near-infrared spectrum (specifically, at a wavelength of 3.8 micrometers that astronomers call the L' band). LEECH exploits the superb performance of the LBT adaptive optics system to image exoplanets with the L/M-band infrared camera (LMIRCam) installed in the LBT Interferometer (LBTI). "The LBT enables us to look at those planets at a wavelength that nobody else is really using," Veillet explained. "Because they are gas giants and still very young, they glow nicely at the L' band, and because they appear so bright there, they stand out, allowing us to observe closer to the star. This has allowed us to nail down the orbits of this system, which is pretty far away." "Normally the problem with this approach would be that at 4 microns, telescope optics glow themselves," said Andy Skemer, a Hubble Fellow at the University of Arizona's Department of Astronomy and Steward Observatory and the lead of the survey. "However, with LBT, everything about the telescope, its adaptive optics system and science camera have been optimized to minimize this glow. As a result, LEECH is more sensitive than previous exoplanet imaging surveys, and this new image of HR 8799 is proof." The study was dedicated to studying the planet architecture of the HR 8799 system, according to the leading author, Anne-Lise Maire, a postdoctoral fellow at INAF-Padova Observatory in Padova, Italy. The team sought to constrain the orbital parameters of the four known giant planets and the physical properties of a putative fifth planet inside the known planets. "To address the first point, we investigated in particular the types of resonances between the planet orbits," Maire explained. "From the resonances, we learn not only about the overall architecture of the planetary system, but also about the mass range of the planets." "They cannot be too massive, or else the system would be dynamically unstable, as previous studies have suggested. Moreover, the presence of resonances between the planets indicates that they gravitationally interact with each other, which gives us a lower limit on their masses." The results of this study favor an architecture for the system based on multiple double resonances, in other words, each of the three outer planets takes about twice as long to complete an orbit around the star as its neighbor closer to the star. "LEECH's unique sensitivity enabled us to probe the inner region of this planetary system," added Wolfgang Brandner, a scientist at the Max Planck Institute for Astronomy in Heidelberg, Germany. "A fifth massive giant planet in an inner resonant orbit was excluded. This could mean that the HR 8799 planetary system has an architecture similar to the solar system, with four massive planets at larger distances, and potentially lower mass planets - which haven't been detected, yet - in the inner planetary system." "Our observations give us good idea that this system is pretty stable," Veillet added, "in other words, there is no indication those planets are going to collide with each other in a few million years." In its current configuration, the inner planet LEECH can see approaches the star to about 15 Astronomical Units (AU), Veillet explained, or fifteen times the average distance between the earth and our sun. "If there were planets of similar brightness closer to the star, we should see it as close as 10 AU," he said, "which corresponds to the orbit of Saturn." According to Veillet, the LEECH survey is an exemplary project in two ways. "It takes full advantage of the adaptive optics performance offered by our adaptive secondary mirrors, and it combines resources from most of the LBTO partners - four U.S. universities, two institutes in Germany, and the Italian community - to build a large program of more than 100 observing nights. This would not be possible for a single partner on a reasonable time scale." Good stuff, we're looking at a solar system that appears to mimic ours. Observations with some of the other instruments that are sensitive at other wavelengths and at higher resolution should follow.